Campus protests need dialogue not safe spaces and offense. Free Speech or Safe Spaces? What college campuses need is dialogue and empathy. 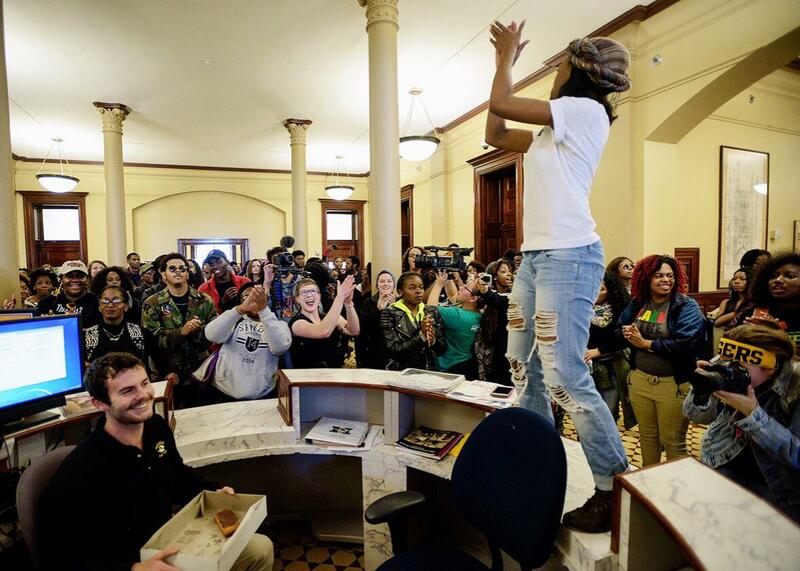 Ayanna Poole, 22, one of the “Original 11” organizers of the University of Missouri protests, stands on the reception desk in Jesse Hall during a march through campus on Nov. 13, 2015, in Columbia, Missouri. It’s come to the point that every successive incident is more cartoonish than the one before. This week the University of Ottawa suspended a yoga class designed for handicapped people because the university’s student federation was afraid the class represented a form of cultural appropriation. Last week Smith College blocked media from a student sit-in unless reporters agreed to explicitly state support for the movement in their coverage of the event. This came just days after student protesters at the University of Missouri denied a student photographer’s access to a public area of campus, with the help of an assistant professor of mass media who shouted, on camera, “Who wants to help me get this reporter out of here? I need some muscle over here.” Before that, students at Yale University clashed with faculty in an incident that began with a disagreement about Halloween costumes. For some, each episode has come to represent the height of political correctness run amok. For others, the episodes represent the need for students to have safe spaces in a college world rampant with racism and fear. But beyond the questions about the relationship of free speech, protest, the possibility of creating safe spaces on campus, and the right to offend, lurk questions that have less to do with the First Amendment than with a spectacular failure of empathy on campus, empathy that may be missing on all sides. It makes no sense, as Suzanne Nossel, the executive director of Pen American Center argues smartly, to mock protesters’ calls for broader recognition of persistent racism on campus. Nor does it make sense to grant them the right to hear on campus only messages that support them. But targeting protesters for public ridicule and Twitter death threats is hardly the answer. Nor can the answer be demanding ever-expanding spaces in which one never encounters an offensive viewpoint. The answer, it seems to me, lies less and less in the First Amendment focus on the right to speak, and more in its implicit obligation to listen. The assumption, for both protesters and for defenders of the right to offend, is that if others will just listen, we can achieve political dialogue. And what we forget in our efforts to speak and to suppress the speech of others is that dialogue involves not just speaking but also listening, and that is the part that we seem to be getting worse at every day. That’s why the real models of dialogue on campus aren’t the administrators who romanticize students’ rights to wear offensive Halloween costumes, or those who demand that all reporters pledge to support them in advance. The real heroes are the ones out on the hustings, making the arguments for safe spaces in public. Some of the smartest pieces about the need to support the students seeking to foster racial justice on campus come from people engaging in acts of persuasion and debate in public spaces. In the absence of debate and persuasion, nothing will change. The fact is that we can either have real discourse, or we can ban real discourse, but we cannot demand discourse that only validates our views. More and more, the campus debates suggest to me that we do not truly believe in empathy as something we give others, but as something we demand of them, as a precondition to dialogue. It’s ironic that as we mince our way to the Thanksgiving table, we are all acutely aware of how others will offend us, and less prepared to hear them out. Thanksgiving reminds us that family and close friends have long been the least safe spaces of all. But we get together anyhow, and we talk anyhow, and we make the best of it anyhow, because the alternative is to scrap Thanksgiving. Here is the problem with framing what is happening on campuses as a fight between the right to safe spaces versus the right to offend: Neither of the two, standing alone, achieves all that much of anything. Real social change rarely comes from within the confines of safe spaces. And there is not much to be said for creating more and more space on campus exclusively for those who agree. There is also not much to be said for those who think that the only valuable discourse is brutal and shaming and silencing. Both sides of this debate risk abandoning the project of real dialogue and real empathy. And when that happens it’s just really a fight over territory.